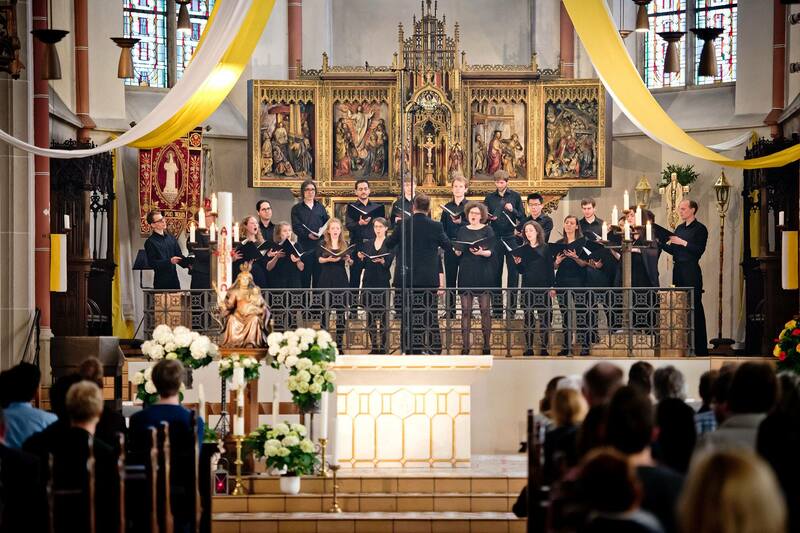 Eager to rehearse and perform ambitious choral music–both liturgical and secular–in a relatively small ensemble, a group of undergraduates from Duesseldorf founded the young chamber choir duesseldorf (junger kammerchor düsseldorf, jkd) in 2014. The debut project presented compositions ranging from Passiontide to Pentecost. As Part of UNESCO’s “International Year of the Light 2015”, this project encompassed vocal works of various artists and epochs revolving around the subjects of light and hope—with musical moods complemented by a spheric atmospheric/evocative lighting concept. The proceeds of one of the concerts in December 2015 went to the initiative “Düsseldorf setzt ein Zeichen”. Choir music with a focus on childhood. Hand painted drawings illustrated Rutter’s “Five Childhood Lyrics”and a captivating presentation engaged the audience. In addition to the three main concerts, small private performances were given at the palliative care unit and the pediatric clinic of Düsseldorf’s university hospital. A musical exploration of central characters of the nativity tale, accentuated by projections on ceiling and walls of the different churches. A cooperation with the Raschèr Saxophone Quartet, contemplating death and the hope beyond. Highlight: The premiere of an adaptation/transcription for saxophone quartet and choir of Arvo Pärt’s Berlin Mass. Compilation of a capella pieces, mainly from the “who made the” project, including two first recordings. Artistic director Mathias Staut (*1983 in Zweibrücken, Germany) studied church and school music, as well as conducting, in Saarbrücken, Köln, Düsseldorf, Trossingen and Bremen. Among his teachers are Anders Eby, Michael Alber and Friederike Woebcken. Master classes and workshops with—among others—Steffen Schreyer, Morten Schuldt-Jensen, Stefan Parkman and sitting in on projects with “WDR Rundfunk Chor”, “ChorWerk Ruhr” and SWR vocal ensemble complement his artistic formation. He was musical assistant to Prof. Raimund Wippermann at Essen Cathedral’s girls’ choir. As part of the Training for Musical Mentoring at the National Academy for Musical and Cultural Education (Landesakademie für musisch-kulturelle Bildung) in Ottweiler (Saarland), he held a position as a teacher for conducting/choir directing. During the two-year parental leave of AMD Silke Löhr, Mathias Staut substituted as the artistic musical director of Heinrich Heine University Düsseldorf’s university choir. Since autumn 2015, he is the musical director ofthe Düsseldorf’s girls’ and boys’ choir (Düsseldorfer Mädchen- und Jungenchor), responsible for both the main and the opera choir. As part of a lectureship at the Institute of Music Education at the University of Münster (WMU), Mathias Staut conducts the Münster Oratorio Choir since summer term 2017. Since summer 2017 he is also the musical director of choir and orchestra at the Basilica of Monastery Steinfeld/Eifel. He was invited by the renowned LandesJugendChor Saar (Youth choir of the federal state of the Saarland) as a guest conductor for an a capella program presented in the course of the 18th International Choir Festival "Voix du monde" in the city of Nancy (France), at the “Deutsches Chorfest” in Stuttgart as well as at various other concerts in Saarland.